BPA Free, non toxic and 100% medical grade silicone. 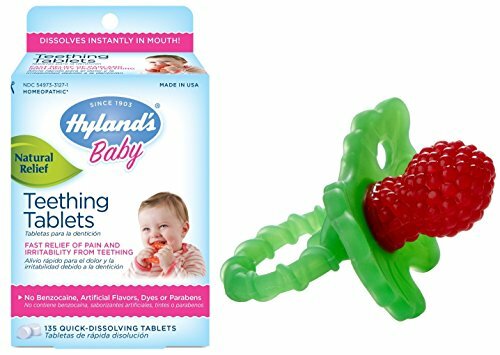 Hyland's baby teething tablets are all natural, homeopathic formula. Relieves symptoms of teething pain and irritability. Soft Tablets dissolve instantly. No artificial flavors, dyes or parabens. RazBaby teether is a stimulating, multi-textured pacifier used to soothe baby's gums. This hands-free all silicone teething pacifier can also be frozen for extra comfort. RaZ-Berry is non-toxic, 100% medical grade silicone and BPA-free.